Actually, it should be copy someone’s identity, shouldn’t it? Or indeed impersonate someone. However, identity theft seems to be the accepted phrase these days. Anyway, if you want to do it, here’s a handy tip which you might find helpful, if your intended victim is a trader who happens to use iZettle. This button is from a pair of trousers I bought from C&A. And no, that doesn’t mean that they are 17 years old, despite the fact that C&A disappeared from UK high streets in 2001. The clothing chain, which I remember my grandmothers routinely referring to as “C&A Modes,” is still going strong on the Continent. Unfortunately, their buttons are’t very strong. According to stereotype, the Germans run railways very efficiently. Not so in the case of my local train service. It is operated by a company wholly owned by the German government, and goes by the rather vague name Northern. 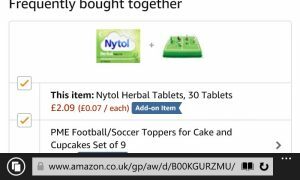 Amazon have plenty of ways to get you to buy more stuff. One technique is letting you know what other customers also purchase with the item you are considering. This occasionally throws up oddities like the strange pairing shown here. I don’t know whether it’s because of Brexit, but there is a subtle change in pronunciation taking place in British English. The phrase ‘the EU’ is said much more frequently these days, as the nation debates the issues around Britain leaving the European Union. It’s a little awkward to pronounce those two ‘e’ sounds one after the other. So people have started to shift from saying ‘thee EU’ to ‘thuh EU’, spoken with a slight stop at the back of the throat to separate the two words. What’s interesting is that this glottal stop is becoming more widespread in general speech. So ‘the orange juice’ becomes ‘thuh orange juice’ even though it doesn’t facilitate pronunciation. One of the many unintended consequences of Brexit! Are you sick of reading about large corporations paying small amounts of tax through clever avoidance schemes? Well now you can play the same game and exploit a tax loophole perfectly legally. Here’s how it works. 80 grams of granulated sugar will cost you about 6p. Add it to a litre of your favourite soft drink, and you save 24p in sugar tax. That’s 18p in your pocket right there. You know that old demonstration of our everyday mistakes in perception? “Paris in the the spring.” When laid out on the page so that the line breaks after the first three words many readers do not notice the duplicate “the”. The problem is, is the government has missed its target. The trouble with that suggestion is, is it’s totally impractical. Here is an example. In this two minute YouTube clip the speaker does it three times. It’s almost imperceptible, but she definitely slips in a duplicate “is” each time. Is this new, or have people always done it? I just received my vehicle tax reminder. The amount you have to pay depends on how much carbon dioxide (CO2) it emits per kilometre. As my car produces rather a lot, I have to pay a huge amount of vehicle tax.